Quiet reading is just a part of what readers have experienced at the library. On March 19, 1981, the BYU men’s basketball team played Notre Dame in the NCAA Sweet 16. With eight seconds to go and the score tied, Danny Ainge drove the length of the court and made a basket to win the game at the last second. Cougar fans erupted in feverish excitement across campus. The streets were filled with jubilant Cougars hanging out of the windows of parked cars, screaming and shouting with joy and pride for their team. My roommate and I joined a large crowd gathering outside the Wilkinson Center. A chanted chorus of “We’re number one! We’re number one!” commenced, and the crowd began to move toward the library. Shoulder to shoulder, the dense group of students marched through the north doors of the library, still chanting. As we marched down the main hall, the librarians looked up from their desks in amazement. A steady stream of chanting students passed through the library and exited the south doors as we continued our march toward the president’s residence. 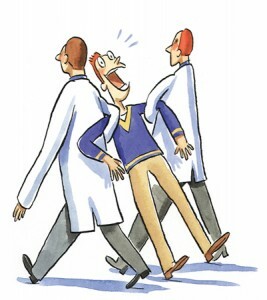 By Jeremy G. Pickens (BS ’97), Milpitas, Calif. 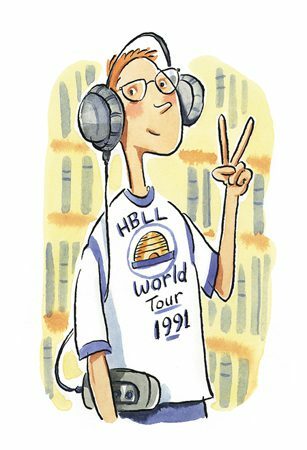 When I was a freshman, one of the English 115 course requirements was a dreaded audio tour of the Harold B. Lee Library. Students were to report to the library, where they were given a Walkman and clumsy headphones. A voice then led you through the various floors, shelves, and card catalogs. The tour itself was useful. The problem was the smirks and guffaws those oversized headphones attracted; you were on public display, and everyone knew exactly what you were suffering through. So when it came my turn, I decided to confront the inevitable awkwardness directly by wearing it on my sleeve, so to speak. I got a white T-shirt and some felt-tip markers and designed my own “HBLL World Tour 1991” rock concert T-shirt. I drew a BYU beehive logo on the front, added the world-tour announcement, and listed the various library sections on the back, the way a band might list the cities it was playing. The reactions I got from passersby in the library were wonderful. Rather than the usual smirks dealt to other touring students, I was met with genuine reactions of delight and laughter, the empathy that comes from shared understanding. By Meredith Black Partridge (BS ’02), Long Beach, Calif.
My sister and I attended BYU at the same time. She loved to study late at night in the library and would occasionally talk me into accompanying her. Invariably I would grow tired long before she was ready to leave, and I’d end up napping with my head on my textbooks until she announced it was time to go. One such night was particularly memorable. When she woke me up, I realized I had drooled a little on my textbook. This had happened on many occasions, and I was confident I could handle the situation without any embarrassment. I lifted my head and did some discreet wiping. My sister began to laugh. Looking around in confusion, I noticed that the guy at the next table was making a valiant effort to hide his own laughter. I suddenly realized they were laughing at me! I whipped out a mirror to discover that my highlighter and my drool had combined to cover one side of my face, which was now neon pink. After several minutes my sister was able to compose herself enough to accompany me to the bathroom. We worked frantically but were unable to scrub away the highlighter. I was forced to walk out of the library and across campus trying to look natural with one hand covering that side of my face. By Judith Manwill Horsley (BS ’56), Sun City, Calif. The year was 1956. It was the beginning of finals week. My roommate and I had been tipped off that there was going to be an “incident” in the Heber J. Grant Library on a particular evening at 7 p.m., when it was full of students studying for finals. We arrived about 10 minutes before the hour and took our places at a table off to the side. All was appropriately quiet. At the prearranged time, a young man in the center of the room stood up and began shouting something like “It’s just too much! I can’t stand it anymore! It’s making me crazy!” Just then, two male students dressed in white jackets rushed in, grabbed the screamer by his arms, and hauled him out of the library, with him shouting all the way. It was over before anyone could react, but it provided all who were in attendance with a much-needed laugh. It had been another long day, but I still had time to study. The main floor of the Harold B. Lee Library had a circle of comfortable chairs near the front doors, where students could read or relax. I found an open chair and sat back. Spanish verb tenses plagued me. Ignoring the commotion of students passing through the doors, I closed my eyes, running verbs over and over in my mind. With the dim feeling that I’d nodded off, I opened my eyes. Nearby empty chairs told me it was closing time. I grabbed my books and went to the exit. The door wouldn’t open. Neither would the next. They were locked. There were no personnel at the darkened front desk. The lights were dimmed. I listened. Nobody. I dinged the front desk bell. No answer. I couldn’t figure out how it had happened. A hundred students must have passed me. Employees would have made announcements and wakened students as the library shut down. Yet, right up front, on display in snoozing glory, I’d slept on. I went to each floor and called out. Nobody answered. I checked back doors and side doors. Emergency-door signs announced that opening them would set off fire alarms and that false alarms were punishable by fine. Finally, I sat on the main floor stairs, wondering how many hours before the cleaning crew appeared or my roommates missed me. Then, a far-off sound—footsteps in the basement, steps on the stairs. A head finally appeared in the stairwell. “Hi!” I said. The guy jerked, then saw me. “You scared me,” he said. “Can you get me out of here?” I despaired. He explained that only BYU security personnel could remove civilians after lockup. Two uniformed officers arrived, took my statement, and filled out an official report. “Now I have a record!” I thought. Way after midnight I arrived back at my apartment, my roommates long asleep. I’m still no good with Spanish verb tenses.